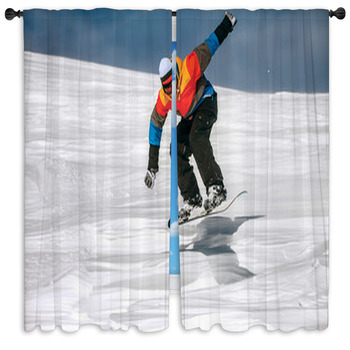 Catch some icy air with these custom snowboard window curtains! 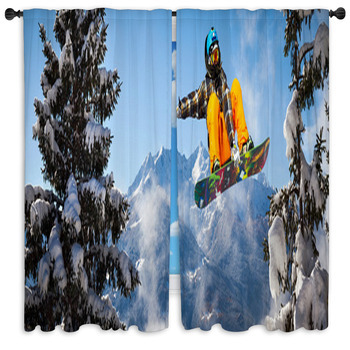 Join in as snowboarders fly and twist through the winter air. 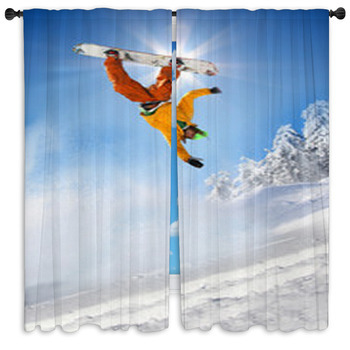 Imagine curtain design that has a snowboarder flipped upside down in the middle of a trick jump. The ground is not visible and tall, snowy mountains can be seen off in the distance under a clear blue sky. 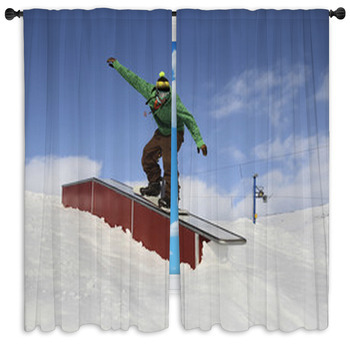 How about one that shows a snowboarder in mid-air as he's jumped off of a snowy slope on a clear, sunny day. 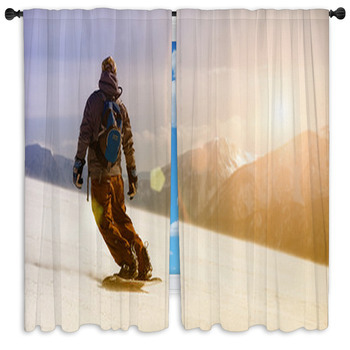 A third stunning image features a snowboarder upside down with only the blue sky in the background and no mountains or ground. 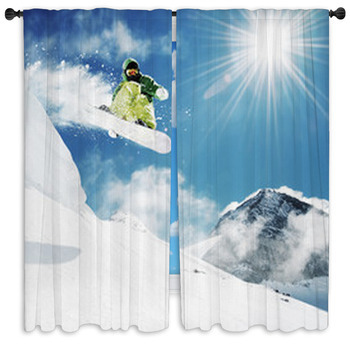 Fly off of the cliff with a snowboarder in the air in front of the bright sun. 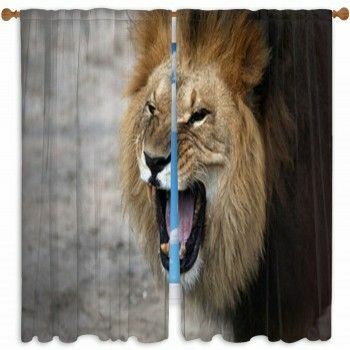 A trail of snow is visible behind the boarder and he holds out the board towards the viewer. 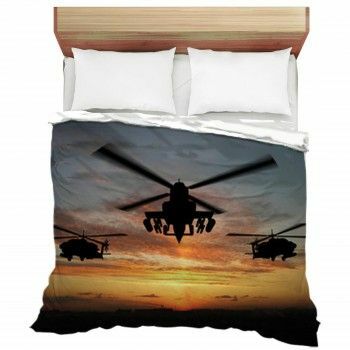 The image is stunning with the white snow, clear sky, and bright sun. Be amazed by more snowboarder stunts such as one with a boarder that has flipped completely around in a 360 motion. The snow that has kicked up around the man makes it almost impossible to see the snowboarder. 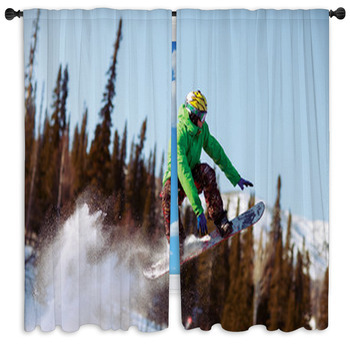 Another great curtain is a close-up of a snowboarder holding onto his board as he flies through the air in a snowy haze. 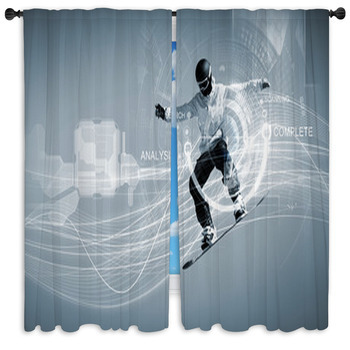 Try an artistic approach with contemporary snowboard window curtains featuring graphic designs such as an image of a snowboarder kicking up snow with a digital shapes and colors expanding behind him. 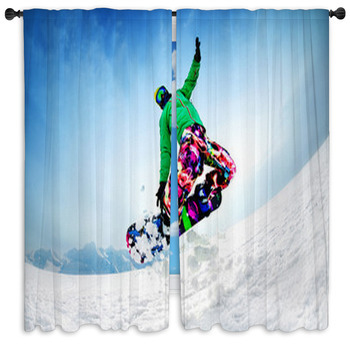 Or see the design with a neon rainbow colored snowboarder that's gliding over the snow. 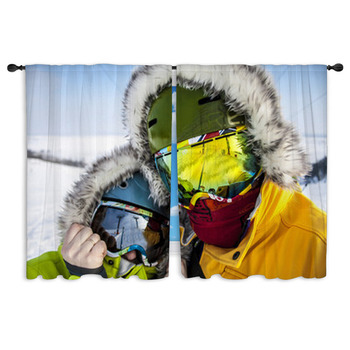 A collage with colorful winter gear such as a face mask, skis, snowboards, boots, and scarves would make a great custom window curtain. 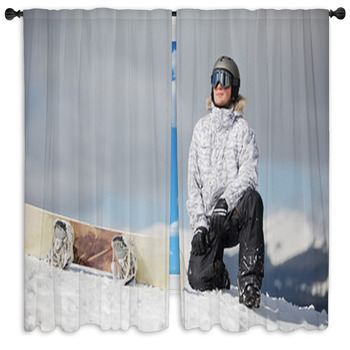 Or go with a more realistic artistic approach with the photo of a snowboard stuck right side up in a snow mound and back dropped by a clear sky in the distance.